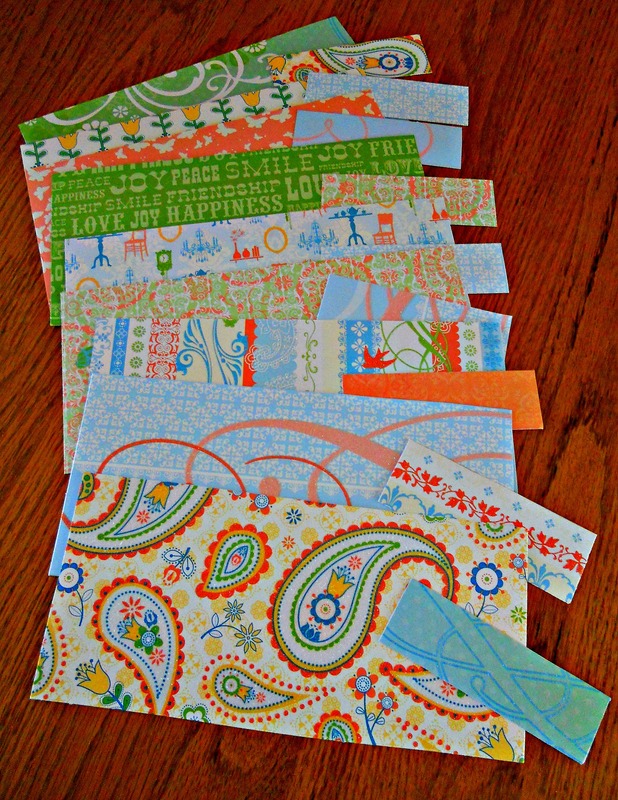 The next best thing to pretty fabric is pretty paper! Although I don’t scrapbook, I love to walk through that department at my favorite craft/sewing stores and couldn’t resist buying this beautiful collection when I saw it marked down from $19.99 to $9.99. (Click on photo for a larger view.) Of course, then I had to come up with a project for it, so here it is! Start by buying some mini composition notebooks. (Target has two-packs for 99 cents.) Then . . .
(1) Use a notebook to make a pattern on a piece of cardboard. Leave a little extra on both sides to fold over the front and back notebook covers, and mark where all the folds should go. 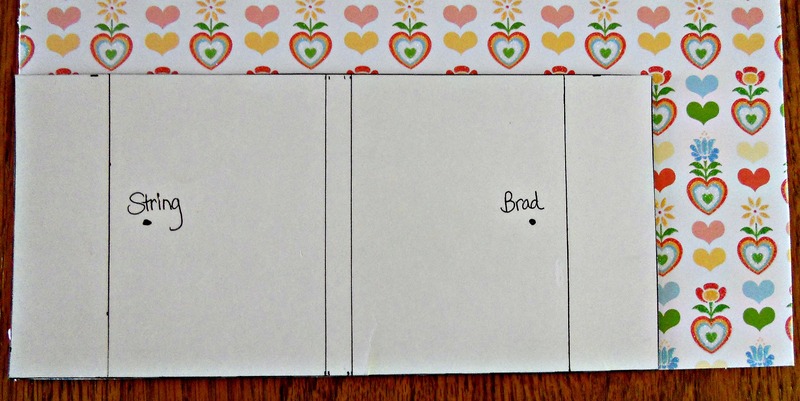 (2) Use the pattern to cut out the scrapbook paper and to draw the fold lines on the back. (3) Fold on the lines the wrong way and then the right way, making firm creases. Then glue the cover onto the notebook starting with the spine, then the covers, then the flaps. 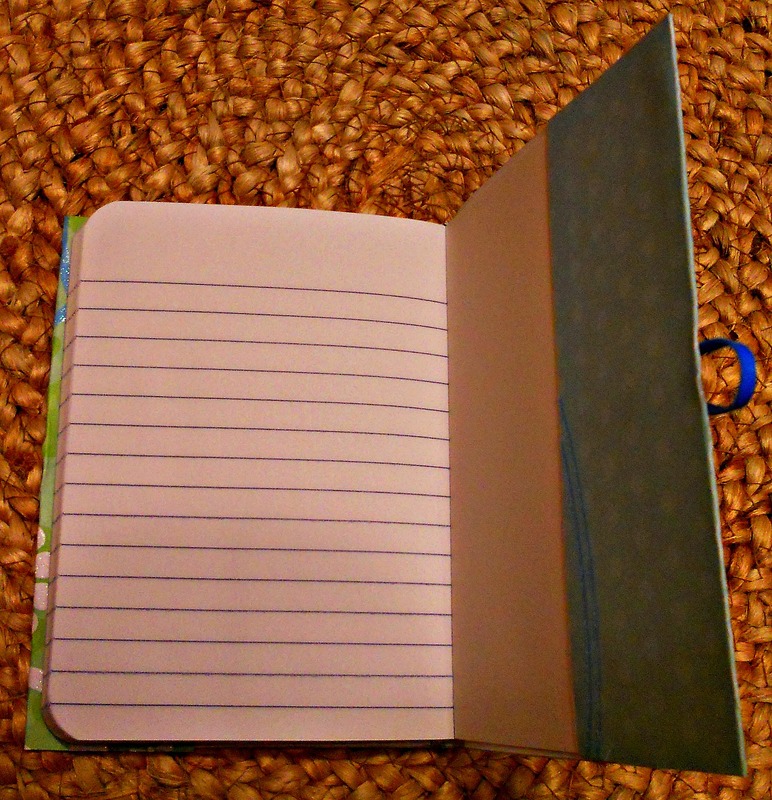 Following are three additional options you can use to “dress up” your notebook . . . choose one, two, or all three. For me, what I chose depended on the cover design. For example, one has cute little birds on it and a spine cover would have hidden one of them, and another has words on it so I didn’t want to cover them with a label. 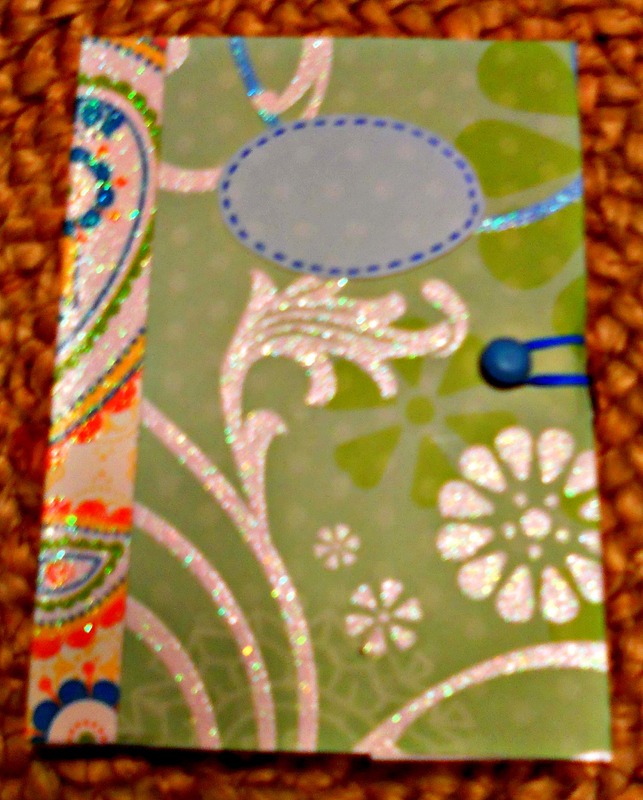 OPTION 1: BEFORE gluing on the cover, put a colored brad about ½ inch from the middle of the edge on both the front and back cover. Put a small coated ponytail rubber band around the back-cover brad and fasten the brad as tightly as possible. Leave the brad on the front cover a bit loose. 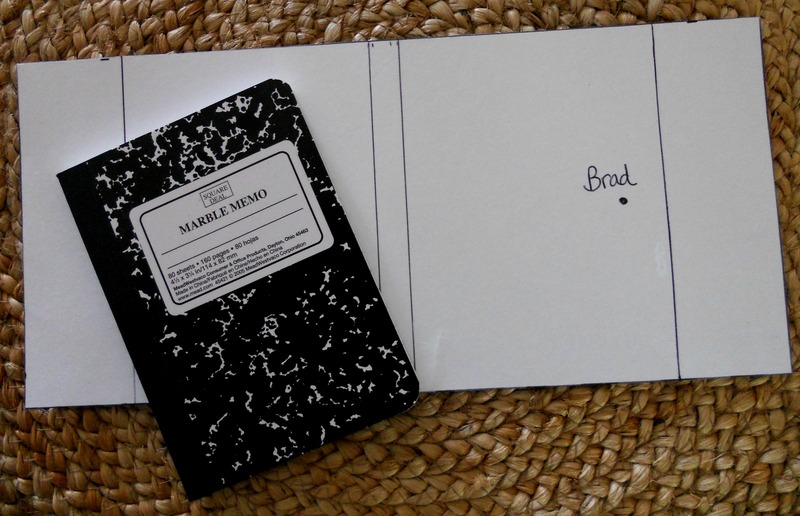 Then, after you glue the cover onto the notebook, pull the rubber band from the back and loop it over the front brad. OPTION 2: Choose a contrasting or coordinating strip of paper for a spine cover, prepare the folds, and glue it onto the spine, holding it for a bit until the glue dries. OPTION 3: Make a small name label out of another scrap. If you like, make “stitches” around the edges with a colored pen. 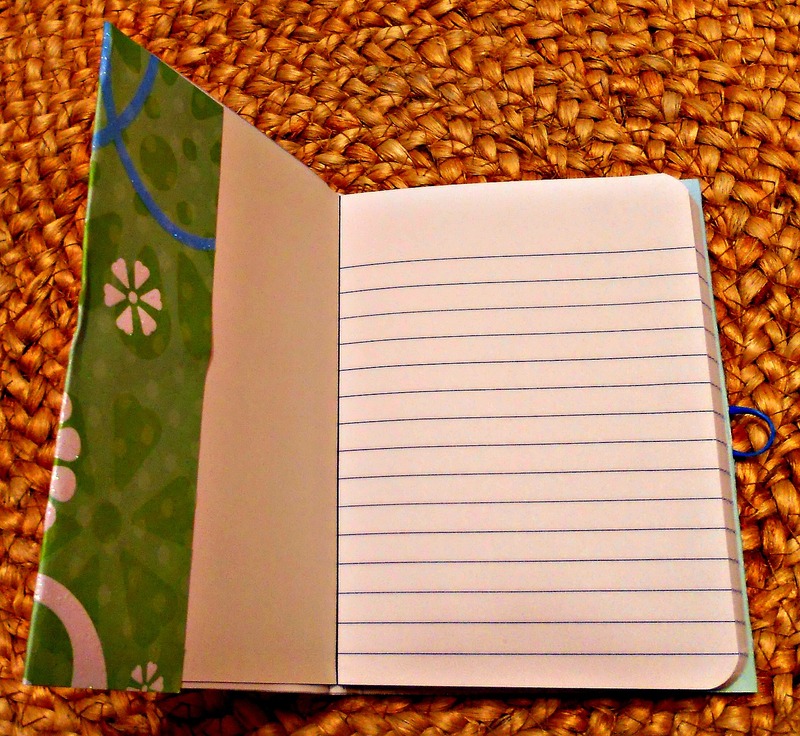 Your notebook is now ready to toss into your purse or give away . . . perfect for a small hostess or gal-pal gift. Or, turn it into an extra-special greeting card by writing a happy birthday/get well soon/congratulations/thinking of you message on the front page of the notebook for the recipient to discover and putting it in a colorful envelope. Now, what to make with the rest of this fun paper . . . ♥ UPDATE: Click here for MORE mini-notebook! Great idea for Christmas gifts. Thank you for your kind comment on my post! Oh so much neater and more beautiful than my versions of the same. Thanks for the cutest little tutorial ever. I love these. The only thing I’m afraid of is when I start making these I may not be able to stop……. you will get a ping back confirming – that should increase your stats. What a good idea! They are so cute. I agree with you about the paper. I purchased some pretty paper and I don’t scrap either. I just couldn’t resist. LOL That’s where I buy mine. This is such a great idea! I wish I had thought of this earlier so I didn’t have to spend so many years with that plain old black and white composition notebook. Cool tute!!!! I love the way your notebooks are looking, so colorful! pinning! I might! my son’s birthday is coming up soon, so I might do some with the kids to give as bday goodies. We’ll see if I’m in the mood lol! What is your username on pinterest i would like to follow you! It is so easy, and it’s like your fave bar but with pictures, so much better! Try it! Super cute! 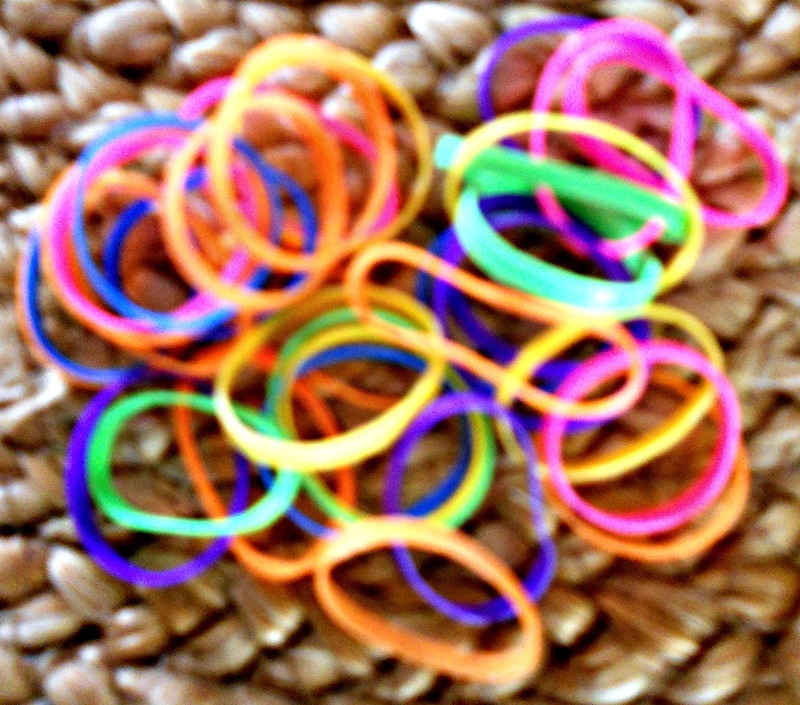 I love the extra punch of color the brads and rubber band give them. Fantastic, beautiful and inspiring – every post I read it’s the same! 🙂 Thank you for sharing! 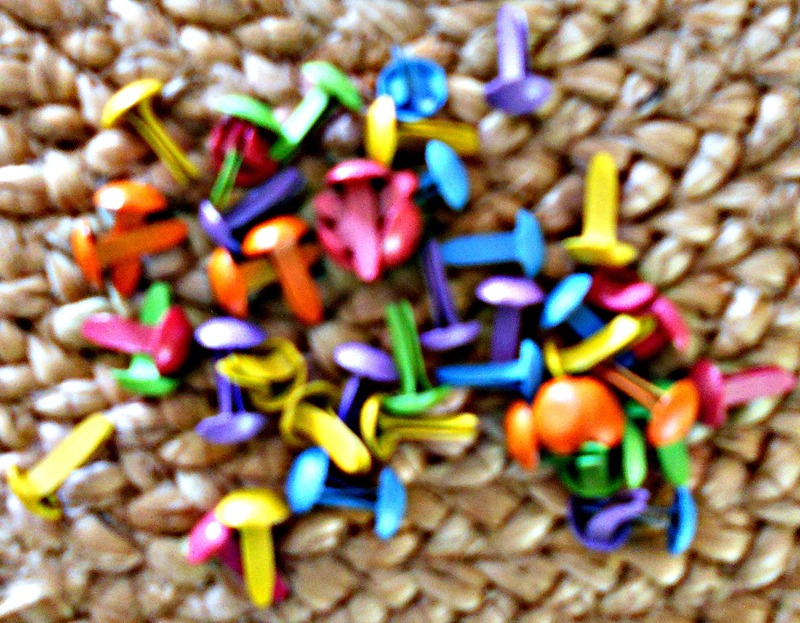 Oh I love these…..pinning now. I’m so sick of buying toys for my girls when they don’t use them and am looking for fabulous ideas that I can make to give them (and others). This would make a perfect gift. Thanks for sharing. What a great idea. 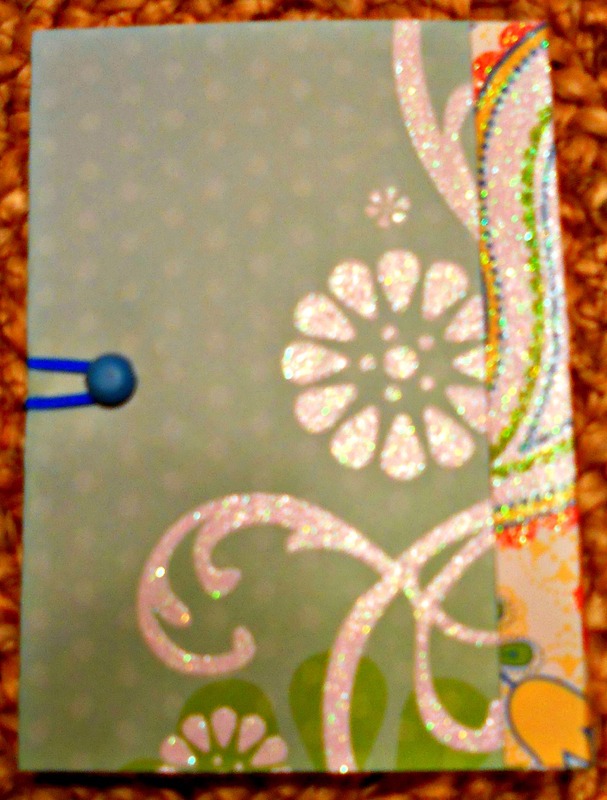 I love notebooks, can’t stop buyin’ em. Now I could actually make my own. Love it! ( and, thanks for giving me a ‘like”). I’m going to keep reading, you’ve have wonderful ideas. I love notebooks, too . . . and have ever since I was little bitty! And thank you for the lovely compliment! I’ve done a few projects like this in the past when I was short on cash but needed a little gift of some sort for a special someone in my life. I like how you made a clasp; mine didn’t have that. Great idea! Thanks for the ‘like’ today on my blog featuring my art project. You have some cute ideas on here, I am going to follow you so I can continue to be inspired by your work! Why didn’t I think of that?? I’ve tried fabric covers and paper covers but they are messy and end up sliding around. So glueing them straight to the notebook is great! Can’t wait to make a few (at least). Thanks for the idea! 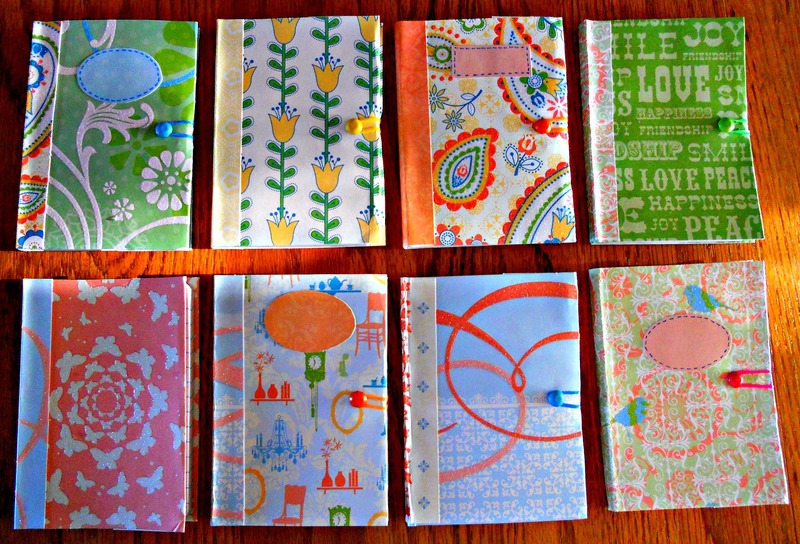 great, great idea – I’ve done a cloth cover before for these little notebooks, but not a scrapbook paper cover. I have a lot of scrapbook paper, too (another of my OCDs at one time). I wonder if I could modify this idea and make a little pointy-type scrapbook paper thingy (I specialize in technical terminology) that comes to the front of the book, instead of the little rubber band, since I don’t have the bands but DO have the paper and peel-n-stick velcro. Hmmmm….now I gotta try it!!! adorable – these would make great party favors or gifts! I’ve been wanting to make a paper or cloth covered recipe book and this tutorial will definitely help! I really like these. I did some afrocentric ones awhile back. I think I may need to revisit beings as though I am always looking for a great notebook. Thanks for the inspiration. No. I’ve done them many years ago. I may make some soon with my daughter who loves to write poetry. A gal after my own heart. Buying scrapbooking paper when I don’t even scrapbook just because it’s so gorgeous is SO something I would do. 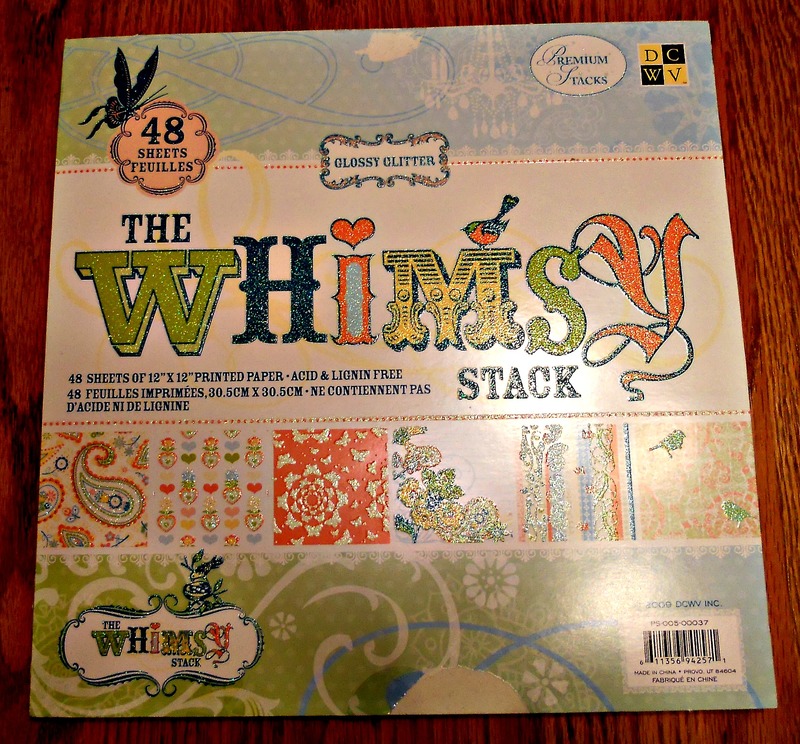 I’ve been itching to buy some of that fabulous paper, but know it will be years before I can scrapbook. Thanks for the idea, I can go buy it now. Easy to make, adorable and useful. Great idea, and cute to boot! That would be awesome!!! I’m already following your blog . . . I know I’ll get so many great ideas! 🙂 Thank you! The notebooks are so pretty. These are just gorgeous! Thank you for coming to visit my blog, I’m enjoying yours! I am definitely going to give them a try… I use them but have never made them! Hi, what a colourful and exciting blog! Keep up the good work! What a brilliant idea. I’m definitely going to try this! I love this idea! I too love scrapbook paper and use it a lot in art. Most stacks give you 3 or 4 of the same kinds of papers so this will be a great way to use up some of the extras. Great dollsize gift, too. I’ve made magazines for dolls before, but hadn’t thought of using the mini-notebooks before. Thanks! It’s a fun hobby, if a bit expensive. 🙂 I’m going to be trolling your blog for ideas for accessories, for sure. Wow, I can see you have brought joy to and inspired a lot of people! Thanks for this and I am glad someone has asked you about the placement of the brads before glueing as I was a little unclear as to whether you meant the flaps or the front cover. Now, it is all clear and a great addition to my primitive covering of books done previously. They will look so much more professional with this technique. Will pop back to follow you more again…. What a fabulous idea! Though it might result in me collecting paper like I do fabric… it is so hard to resist, even though I do not scrapbook either. Mini notebooks! How cute? Plus a tutorial! Can’t beat that! This is such a creative idea! I need to try this for sure. These are lovely, such a nice idea – I’ve been meaning to make covers using fabric for a while but I might do paper too! I just pinned you on to my Pinterest site – Liz Fox Maybe you’ll get some neat visitors. What a great idea, I love the colours! Love your choice of fabrics. I also love to make mini notebooks. I use washi tape, other decorative tapes, and I also have a xyron creative station I use to make scrapbook paper and cloth adhesive for these. i love to sew…this rocks!!!!!! Hey, these are cute. I love that you use so much color in your projects Katherine. It’s always a bucket of cheer when I snoop around.